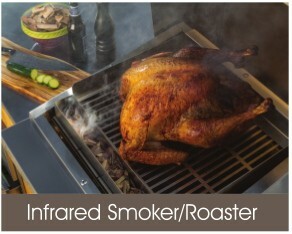 Adding a TEC Smoker/Roaster to your Patio FR grill and it becomes an infrared smoking/roasting machine. Manufactured of 304 stainless steel, this two piece combo includes a slotted meat rack and heavy duty 14 gauge stainless drip pan. The meat rack slides easily over the back of the grill’s hood body and extends to the front of the grill, leaving a small area of grate exposed for replenishing wood chips when smoking. The drip pan is designed to be placed directly on top of the cooking grates beneath the meat rack. 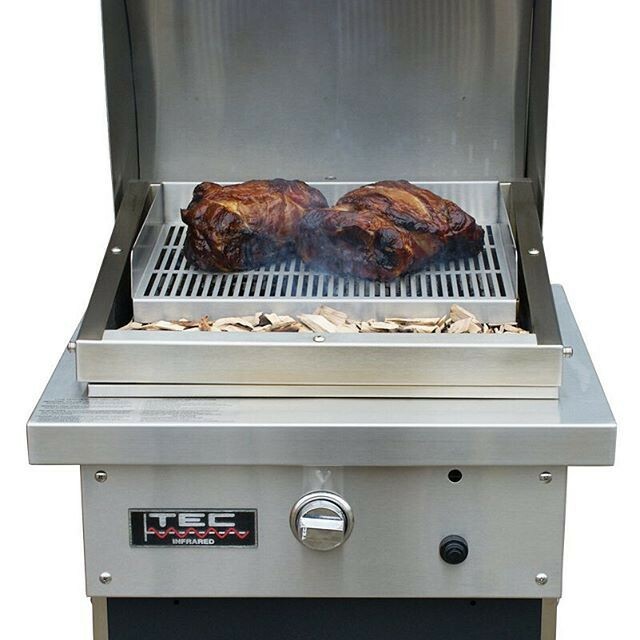 It not only collects the drippings from food but further slows the cooking process to ensure a low, slow barbeque, roasting, and smoking experience. © 2019 GrillTechs.com. All Rights Reserved.